Citation: A Andron, M Seelenfreund. Premacular sub-hyaloid hemorrhage in a patient with factor V leiden treated with YAG laser: A case report. J Clin Ophthalmol. 2018;2(1):38-40. Factor V leiden is an inherited disorder of blood clotting causing hypercoagulability and can often lead to retinal vein occlusions. This purpose of this case report is to present a spontaneous sub-hyaloid macular hemorrhage and impending retinal vein occlusion in a young woman found to be positive for factor V leiden. She was treated with YAG laser to open the posterior hyaloid face. This led to complete resolution of the hemorrhage with return of 6/6 visual acuity. We conclude that YAG laser treatment is an affective treatment in spontaneous sub-hyaloid macular hemorrhage in a positive factor V leiden patient. This is the first case study of spontaneous macular hemorrhage in a patient with such a mutation. This report also demonstrates the efficacy of YAG laser for premacular hemorrhage, which produces a rapid resolution and improvement in visual acuity. Premacular subhyaloid hemorrhage is defined as an accumulation of blood between the posterior hyaloid and internal limiting membrane. The bleeding originates from the capillaries of retinal blood vessels, and often appears clinically as a circumscribed boat-shape mound of dense blood in the macular area . This causes profound painless central visual loss. This condition can occur as a result of retinal vascular abnormalities such as diabetic retinopathy, retinal vein occlusion or retinal macro-aneurism [2,3]. It can also result from a hematologic disorder such as anemic retinopathy often presenting in leukemia patients or due to Terson’s syndrome Valsalva retinopathy [4-6]. Both observation and vitrectomy are accepted treatments . Most often spontaneous resolution of the hemorrhages occurs but it might take several months. In longstanding nonresolving cases, complications can occur such as epiretinal membrane and macular traction, pigmentary macular changes, and toxic iron or hemoglobin to macular causing irreversible reduction in vision . An alternative treatment is to create and opening in the posterior hyaloid by YAG laser, this opening allows the blood to flow into the vitreous and removes the obstruction covering the macula . This treatment has proved safe and effective with quick resolution of premacular hemorrhage and restoration of visual function . This case report describes a patient who underwent YAG laser hyloidotomy for premacular hemorrhage. Upon workup, this patient was found to have factor five leiden. A 47-year-old healthy woman presented with acute onset painless visual loss. On examination visual acuity was counting finger at 1 m. On dilated ophthalmoscopy, the fundoscopic exam revealed a large sub-hyaloid hemorrhage, with additional small peripappilary hemorrhages and tortuous vessels (Figures 1 and 2). Because of the possibility of impending central vein occlusion, she was initially treated with an intra-vitreal injection of Avastin. In addition, she was sent for a full workup for coagulation defects and she was found to be positive for factor V Leiden. At fifth day follow up, the hemorrhage enlarged, but the veins were less engorged. Yttrium Aluminium garnet (Yag) laser was performed to create a small opening at the inferior part of the posterior hyaloid covering the hemorrhage. This immediately allowed the entrapped blood to enter into the vitreous cavity removing it from causing macular damage. One-day post laser the patient’s visual acuity dramatically improved 6/12 which improved with a pinhole to 6/9.5. On examination all blood had drained from the area of the sub-hyaloid with blood now present in the inferior vitreous. Three weeks post laser the vitreous hemorrhage had cleared and the patient had a visual acuity of 6/6. On fundoscopic exam the macular area was normal. Three months post laser treatment the retinal vessels had returned to normal. 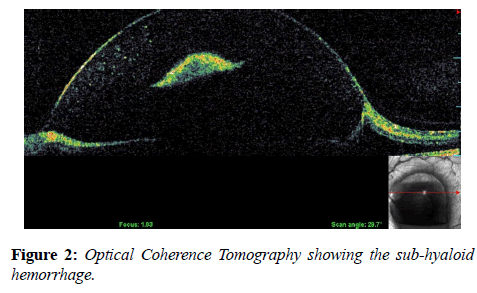 A fundus angiogram and optical coherence tomography (OCT) were performed and interpreted to be normal (Figures 3 and 4). 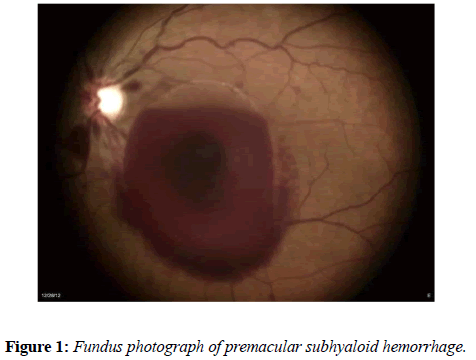 Figure 1: Fundus photograph of premacular subhyaloid hemorrhage. Figure 2: Optical Coherence Tomography showing the sub-hyaloid hemorrhage. Figure 3: Fundus photograph shows complete resolution of the hemorrhage. 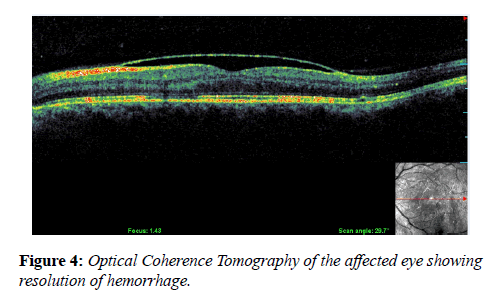 Figure 4: Optical Coherence Tomography of the affected eye showing resolution of hemorrhage. This patient had premacular subhyaloid hemorrhage as a result of impending vein occlusion and was found to have the factor V leiden mutation. Factor V leiden is an inherited disorder of blood clotting causing hypercoagulability . It is the most common hypercoagulability disorder among Eurasians. The mutant variant of factor five cannot be inactivated by protein C, causing hypercoagulability and thrombosis. Any otherwise healthy, young patient that presents with a thrombotic event must be tested for factor five leiden. Patients that have factor five leiden can present with recurrent deep vein thrombosis, pulmonary embolism, multiple miscarriages and also retinal vein occlusion . Although the main acquired risk factor for retinal vein occlusion is hypertension, younger patients with central retinal vein occlusion, need to be investigated regarding use of oral contraceptives, vasculitis and thrombophilic factors. A number of coagulation disorders increase the risk of systemic venous thrombosis, Factor V Leiden being the most frequently identifiable cause . As mentioned above longstanding hemorrhage covering the macula can result in long-term retinal complications such as epiretinal membrane formation and macular pigment changes. Although observation is an accepted treatment, we chose to treat with YAG laser. Only one application of laser focused on the posterior hyaloid was needed, leading to rapid exit of the blood from sub hyaloid space and restoration of visual acuity. This treatment allows a quicker visualization of the macula with rapid improvement of vision, and can prevent further more invasive procedures such as vitrectomy. YAG laser hyaloidotomy is a safe treatment that can be performed in an outpatient setting. There are, however, rare reported complications from this treatment such as rhegmatogenous retinal detachment, macular hole and extensive bleeding . This treatment can be used in a large dense bleed obstructing the macula. This report demonstrates the efficacy of YAG laser for premacular hemorrhage, which produces a rapid resolution and improvement in visual acuity. Gass JDM. Stereoscopic Atlas of macular Diseases: Diagnosis and Treatment, 3rd ed. St. Louis. MO: C.V. Mosby. 1987;560-4. O'Hanley GP, Canny CL. Diabetic dense premacular hemorrhage. A possible indication for prompt vitrectomy. Ophthalmology. 1985;92(4):507-11. Moorthy RS. Dense Premacular Hemorrhage from a Retinal Macroaneuyrsm treated by Argon laser. Retina 2000; 20:96-8. Khadha D, Sharma AK, Shrestha JK, et al. ND: YAG Laser for Subhyaloid Hemorrhage. Nepal J Ophthalmol. 2012; 4(7) 102-107. Monshizadeh R, Tariq Bhatti M, Levine L, et al. 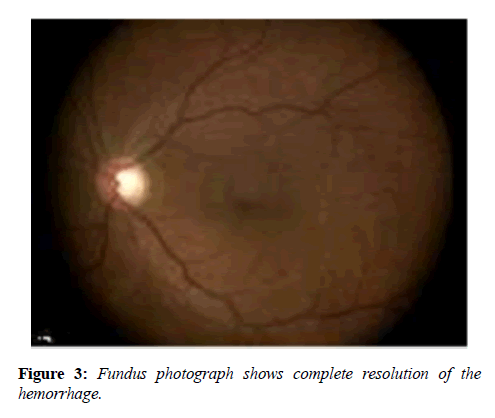 Photodisruption of dense Preretinal Hemorrhage with Nd:YAG in a child with Terson's syndrome. J AAPOS. 2002;6:56-8. Duane TD. Valsalva hemorrhagic retinopathy. Am J Ophthalmol. 1973;75(4):637-42. Adel B, Israel A, Friedman Z. Dense Subhyaloid hemorrhage or subinternal limiting membrane hemorrhage in the macula treated by Nd:YAG laser. Arch Opthalmol 1998; 116(11):1542-3. Rennie CA, Newman DK, Snead MP, et al. Nd:YAG laser treatment for premacular subhyaloid haemorrhage. Eye (Lond). 2001;15(4):519-24. Banik S, Bhutto HU, Bagga P. Recurrent Branch retinal vein occlusion with factor V leiden mutation. Eye (Lond). 2006;20(8):948-9. Incorvaia C, Bandello F, Parmeggiani F, et al. Recurrent central venous occlusion in a young thrombophilic patient with factor V leiden mutation. Eur J Ophthalmol. 2002;12(2):131-4.